Although Norris started the grand prix eighth on the grid, he lost places at the start. 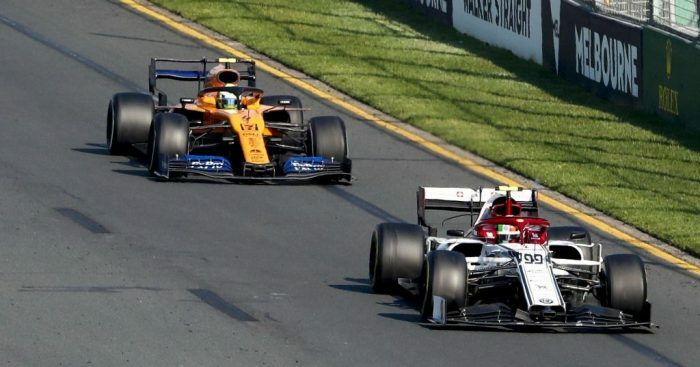 The British rookie lost even more ground when he came in for his one and only pit stop of the afternoon, dropping to 12th place behind Giovinazzi. Norris struggled to pass the Alfa Romeo driver, who opted for a long first stint that led to a train of cars running behind him. By the time Norris was able to pass him, it was too late, he was overtaken by Lance Stroll and Daniil Kvyat. “It was too late,” he said. “It obviously cost me the positions on Kvyat and Stroll, which obviously put me out of the points in the end. “I’m a bit annoyed because there was a lot more potential, the car had the pace to be in the top 10. “Basically I let everyone down so I need to make sure that doesn’t happen again. Norris, making his McLaren debut, finished the race in 12th place. Asked if he was proud of his performance at first-ever F1 grand prix, he replied: “Of myself, not that much. Of the team I think I’m pretty proud. “I had a pretty good car today. Not perfect but overall it had enough pace in it to be in the top 10. “I just made a couple of mistakes that put be outside of it which is why I’m not as happy as what I was yesterday.